Warning to Southland viewers who missed this week's episode: stop reading now if you wish to be surprised by a major development on "Code 4." Okay? Others still with us? Good. 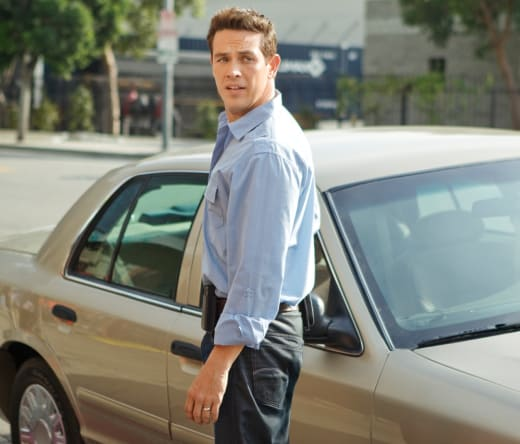 Then read on for excerpts from an interview Kevin Alejandro gave to TV Line, in which he discusses his character's fate on that drama and also looks ahead to a new season of True Blood. Why did he decide to leave Southland? I’m fortune to be a part of this show from the very beginning, from the pilot. We did our thing on NBC and went through a roller coaster... and all of this happened during a time where there was a big transition and no one knew what was going on, so we were all in dark on what was happening with Southland. And in between there, I was offered a role on True Blood. Could he have done both shows? The schedules are very similar. And toward the end, I was two days on Southland, two days on True Blood and going back and forth between the two shows. And now that this season of True Blood is considered the season of witches, I’m there all the time now. It would have been complicated [to do both]. All I can tell you - because they’re really tight-lipped over there - is that Lafayette and Jesus are both there and you’ll see a lot of us. You will definitely get to know Jesus better - and he’s a pretty likable guy. There definitely will be more interaction between Jesus and other characters this season, too.